The Millionaire’s Club provides seed grants and a detailed curriculum, developed by the National Endowment for Financial Education. 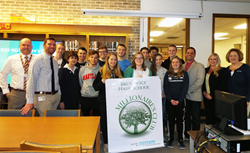 In partnership with the Credit Union Foundation of MD/DC and Frederick County Public Schools, Nymeo Federal Credit Union is sponsoring the Millionaire’s Club at Brunswick High School in Frederick County. The school is the first in the Frederick County Public School (FCPS) system to host this financial literacy club that is designed to actively teach students leadership and entrepreneurial skills. The Club also engages students in competitions such as “The Stock Market Game”. Students elect their own leaders and actively participate in programs including an entrepreneurial project that allows them to put into practice their newfound skills to generate funds for the Club. High schools interested in providing the Millionaire’s Club may contact Nymeo at marketing(at)nymeo(dot)org for more information. Nymeo is a federal credit union and a cooperative not-for-profit financial institution. Our mission is to promote each member's financial wellbeing. We are a one-stop financial center with a vast array of products and services to meet a member's need over their lifetime. Membership at Nymeo is open to anyone who lives, works, worships, attends school or conducts regular business in Frederick County, Maryland. For more information about Nymeo, please visit us at nymeo.org.